Positives and negatives for Selby in this loss to a forward orientated Heath XV. Selby’s delayed opening fixture of the Yorkshire One season ended in a not unexpected heavy defeat away at the hands of a Heath club who many expect to be vying for promotion, come the season’s close. While this may be some consolation to Selby, and the score line even somewhat flattering to the hosts, the Swans need to build on the positives from this match, while not forgetting to work on improving the negatives too. In contrast to last week’s glorious sunshine the Vale of Heath was shrouded in gloom with the rain persisting it down all match making handling difficult, so credit to both teams who managed the conditions well to provide a good, hard fought spectacle for the soggy spectators - which remained close until Heath pulled away in the second half. The main problem for Selby wasn’t the weather though – it was Heath’s absolutely massive pack who, allied to the fact they were also reasonably competent, dominated the game and made all of the difference when it mattered most. In the loose, Selby coped admirably with Heath’s big boys with some gratifyingly thumping tackles coming in from both forwards and backs alike and with Heath returning the favour, play was limited to a not unentertaining midfield slugfest for the opening quarter. Heath, however, were completely dominant at scrum time and also had by far the better kicking game so percentages, and better field position, inexorably and inevitably started to take their toll on Selby - with any penalty conceded being in range for Heath’s very competent kicker to open a 6-0 lead. Selby, without much in the way of their own kicking game, were reduced to having to run everything in difficult conditions and with errors resulting never managed to get near enough to the Heath line to be able to land any of the penalties they won, never mind crossing for a try. Heath then capitalised on a series of penalties to camp on the Selby line and after much valiant Swans defending, pressure eventually told for a Heath try and 13-0 half time lead. With the game by no means lost at half time Selby then, disappointingly, lost their first half intensity and, to put it bluntly, played very poorly for the next twenty minutes – allowing Heath to dominate possession and territory to power over for several short range tries and a 32-0 lead. 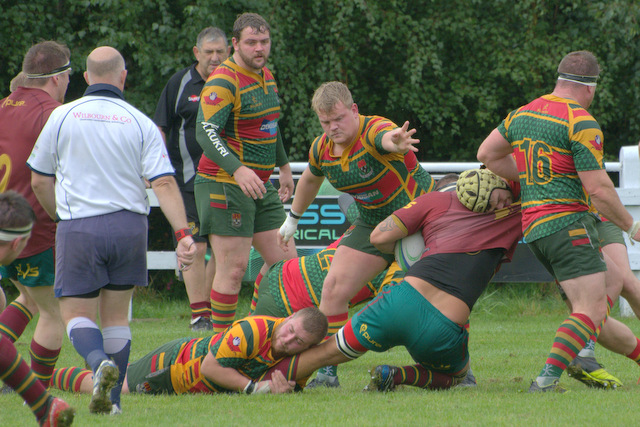 Selby, however, did manage to get their mojo back for the last quarter and, with the rain suddenly abating, some enterprising and expansive play from forwards and backs had Heath stretched on a number of occasions before centre Alex Webster crossed for a deserved consolation score near the end for a final score of 32-5. Selby will be hoping to open their league account at home this Saturday against Bradford Salem with kick off at 3pm and all are welcome.